"Orbital debris is a serious issue, but at the same time, the sky is not falling," J.-C. Liou, of NASA's Orbital Debris Program Office in Houston, said during a presentation with the agency's Future In-Space Operations working group Wednesday (Feb. 22). Earth is surrounded by a gigantic cloud of debris — stuff like spent rocket bodies, dead spacecraft and the fragments generated when these objects collide. NASA estimates that this cloud contains about 22,000 pieces as large as a softball and 500,000 bigger than a marble. The number of pieces at least 1 millimeter in diameter probably runs into the hundreds of millions, Liou said. All of this junk poses a threat to the 1,000 or so operational satellites currently zipping around our planet, as well as the International Space Station and other crew-carrying craft. "The typical impact velocity in low-Earth orbit is about 10 kilometers per second [22,300 mph], and because of that, even a sub-millimeter debris could be a problem for human spaceflight and for robotic missions," Liou said. Many researchers think the amount of space junk around our planet has reached a critical threshold. 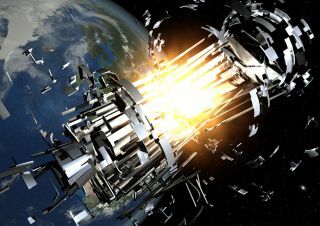 There's now so much of the stuff that collisions will generate a continual, ever-escalating cascade, causing the debris cloud to keep growing even if humanity grounds all of its rockets. The international space community has devised some strategies in an attempt to mitigate the space-junk problem. Toward the end of a satellite's life, for example, operators are supposed to burn off any remaining fuel and discharge batteries to render the spacecraft less explosive. But mere mitigation likely won't be enough, according to Liou. "There is a need for a more aggressive measure to protect and preserve the environment," he said. "The time has come for us to consider active debris removal." A modeling study Liou published last year suggests that active removal, combined with standard mitigation measures, could help reduce collisions and keep our space-junk cloud from cascading out of control. If humanity pulled five large objects out of low-Earth orbit — which extends to roughly 1,240 miles (2,000 kilometers) above the planet's surface — every year starting in 2020, debris levels in 2210 would remain roughly where they are today, the study found. Suitable targets for removal include old rocket bodies and dead satellites, because they're massive and numerous. Liou recommends against going after satellites initially; they're a diverse bunch in both size and structure, so it would be relatively tough to design a system capable of grappling many of them. Rockets are a better first choice, Liou said. He suggests starting with spent Russian SL upper stages, which make up much of the orbital debris population. These rocket bodies weigh up to 8.9 metric tons, and their uniform structure would make them relatively easy to handle. Roughly 62 percent of the 2,700 metric tons of debris in low-Earth orbit were launched by Russia or its forerunner state, the Soviet Union, Liou said. It's a good thing humanity has a decade or two to work on debris removal strategies, because no system is ready to go at the moment. Meaningful debris removal will also take a great deal of international cooperation. The Russians still own those SL upper stages, for example, so the United States can't just go up and grab them without getting the go-ahead from Moscow. Acting unilaterally could be destabilizing on its face, since some nations would doubtless regard a device capable of de-orbiting space junk as a potential space weapon. If it works on a dead satellite, after all, it may well work on an operational one as well. For all of these reasons and more — including the scope and cost of any removal effort — the world will probably have to tackle the space junk issue together. "This is an international problem," Liou said. "We cannot do this by ourselves."